I am spending a few days in Sharm el Sheikh at the base of the Sinai Peninsula. Today, in the tour office where I was arranging a boat trip for tomorrow, I saw a map. It showed three countries, Egypt, Palestine (which covered all the area of Palestine and Israel) and Jordon. Not one Israeli city was on the map include Eilat. I wondered if this was an old map, a current map or a horrible dream of a future without Israel. It was ironic that I saw this in a tour office. 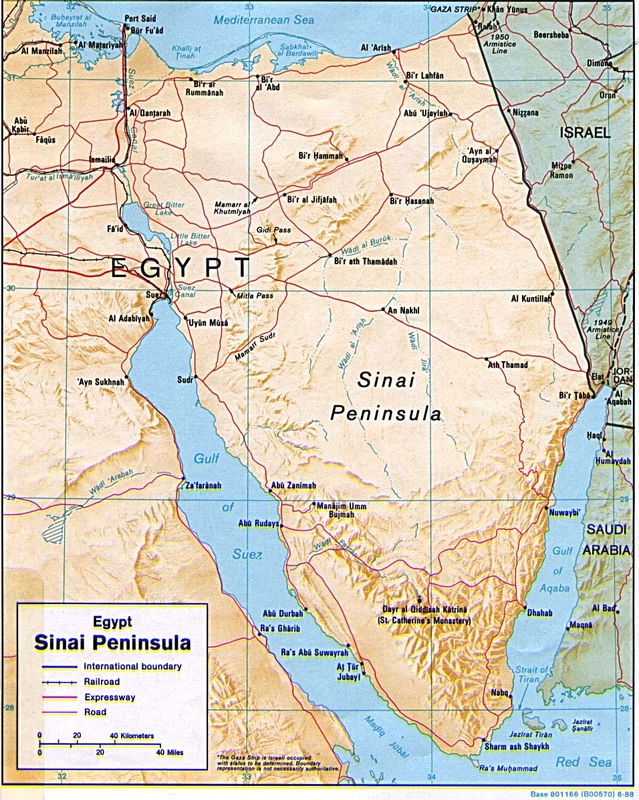 Israel was the country the developed Sharm as a tourist destination during the period it occupied Sinai and it turned all that over to the Egyptians who built extended the work the Israelis did in developing Sharm as a tourist destination. Sharm is part of Egypt and is set up to make it easy for tourists. For instance you do not need a visa. There are many flights to Sharm from all over Europe and particularly for England and Russia. Sharm has more that 30 hotels including several 5 start hotels. It is basically a peninsula with one of the water ways being the Gulf of Suez (leading to the Suez Canal) and the Gulf of Aqab. At the top of this Gulf lies there cities, Taba (Egypt), Eilat (Israel) and Aqaba (Jordan). You can actual travel from Egypt to Jordon via Eilat in about ten minutes. On the very top east of Sinai, is Gaza one of the greatest hell holes in the earth with a populations of 500,000 people in an area about 17.5 sq miles. Contrast that to Sinai which has 23,000 Sq miles for 1.3 million people. I always have to wonder why those that rag on Israel (rightfully or wrongly) never call out Egypt for not doing much of anything to help the Palestinians. Why could Israel and Egypt not cooperate to build a resort area in the Mediterranean in Egypt just next to Gaza that could employee some of these people. The Gaza people have lots of construction experience.Or why not set up factories there. Or do something to help these people. By the way, Gaza is a bit less than 50 miles from Tel Aviv and every year the missiles they send get a bit closer to the large Israeli population centers. It is a little like having al-Qaida based in San Jose and sending missiles at Palo Alto but hoping to send them into San Francisco soon. Tags: Gaza, Sinai. Bookmark the permalink. I raised the same question quite a few year ago to a friend’s father who was the Chilean council to Tel Aviv. His view was that nothing ever happened to quiet the strife because it was in the interest of the US to provoke it to keep the Saudis in line. The conversation whet further than I can go here, however, I believe sincerely that since that time, a number of thing have changed to alter whatever foolish motives existed then. In particular, if Israel wants to remain a Jewish state, they must establish a separate friendly state of Palestinians. The key word here is friendly in the same sense as now exists between them and Egypt. To accomplish this, Hamas not only needs to change its mood — it sldo needs to change its name (meaning NEVER). Dealing with the relevant emotions is critical, and my concern is that, since the exception of Rabin, Israels leaders and Arafat earlier have constantly rung the bell of strife at our urging. Hopefully, we can expect higher levels of emotional maturity on both sides in the near future. I suspect that this will have to be built from the grass-roots on both sides. I, for one, shall do all I can to support this. As Daniel Pipes explained it back in 1988 in his very balanced article “Is Jordan Palestine?”, Palestinians are not the same type of people than the Jordanian neighbors. They are very nationalists, very actives, with a very strong feeling of we belong here, opposite to the Jordanian who still, for many of them, have no connexion to their recently given country. Since 60 to 70% of Jordanian are Palestinian, and since PLO (remember the Jordanian-PLO 1970 war) until today (but you won’t read it anywhere) have a eye on conquering Jordan, Amman is really not interested in opening its country to the explosive West Banks and Gaza Palestinians. On the other end, since Hamas is a child of the banned Egyptian Muslim Brotherhoods group, and since Mubarak is working hard for his country’s fragile secular stability, he is really not interested in opening its country either (which is why he created a total blockades of Gaza and he just finished the building of an iron wall). For us, Westerners, its not easy to handle the tribe concept that still dominates Arab countries state of mind, to handle the way they interact with each group according to their past few century experience (don’t forget that their religion ask to leave in the past, and that does apply to politics too). Bottom line, as in Egypt, Syria, and Jordan, only a very strong secular dictatorship can manage the Palestinian future. And it will happen with Israel, not with Egypt and Jordan who will almost forever remain fearful of the Palestinian.